Must Like Spinach, my new MM romance novel, releases via Kindle Unlimited in two weeks! When Jonathan Fournier leaves New York for Seattle, a short-term business project sows the seeds for long-term love. If you regularly review my work on Amazon, feel free to message me here via the comment button, or at con.riley.fiction@gmail.com for an ARC. Jon’s future in New York seems bright. He’s on the corporate fast track as an executive problem solver, yet he can’t help feeling hollow. Yearning for a life spent outdoors makes no sense if he wants to flourish in this city, nor does losing his cool with clients when they make bad decisions. Only leaving the East Coast behind for three months can save his business reputation. Want to know when the book will release? Subscribe here and I’ll notify you on release day – October 21st. I promise never to spam you — you’ll only ever get a notification from me if I have a new title on the way. I’ll also add new and old subscribers to a giveaway on release day. I hope you all enjoy Jon’s story. While I was busy writing brand-new things for 2016, Dreamspinner Press were busy getting True Brit onto Audible! It’s so cool to have my self-pub title picked up like this for audio and foreign translations. Dreamspinner’s proactive stance encouraged me to enter True Brit into Kindle Unlimited this weekend. If you already read True Brit, I hope you enjoyed Ed and Pasha’s story. If you haven’t read it yet, it’s available here on Amazon and here on Audible. My latest novel, Salvage, is due for release by Dreamspinner Press on September 16th. 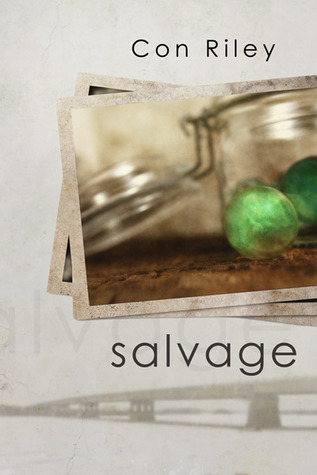 Salvage can be pre-ordered here!